Making A Parade For Jesus offers 52 easy-to-use children's object lessons for the entire church year. The lessons are based on New Revised Standard Version gospel texts, mostly from Luke. Simple delivery: ""Good morning boys and girls! Have you ever ...""
Easy-to-gather objects: You'll need a map, flashlight, dog leash or magnifying glass to tell about searching diligently for the child (Matthew 2:1-12). Clear directions: Set in italic type, you'll know when to ""let the children answer, or give directions."" All objects are easy to relate to and fun to use. For example, you may need, napkins, light bulbs, pens, valentine card, and binoculars. The table of contents lists the scripture passage used with the lesson title. Wesley T. Runk is a pastor in the Evangelical Lutheran Church in America. He is a graduate of Wittenberg University and Hamma School of Theology. He served congregations in Englewood and Lima, Ohio before founding CSS Publishing Company in Lima. 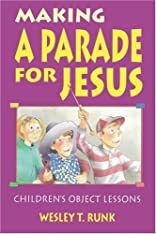 He has written over 20 children's object lesson books and is committed to helping congregations minister effectively to their children during worship.